In what turned out to be a home away from home for the Bollywood elite, Toronto, Canada provided some of the most raucous and sensational outpouring of enthusiasm for the stars at the IIFA awards this year. The host city was abuzz and the excitement culminated with the awards taking place at the city's largest event complex, the Rogers Centre. "Dabangg" matched the monstrous nature of the venue by snagging an astounding eight awards, including "Best Picture of the Year". 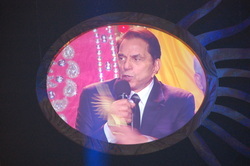 The evening including a special award given to Dharmendra Singh Deol for 50 years in cinema. The 75 year-old Bollywood legend took the stage to revel and reflect in boisterous and nostalgic fashion at his fantastic career. Karan Johar did a good job keeping things moving and injecting comedy into the evening as the co-host. He also picked up the "Best Director" award for his work on "My Name is Khan." Priyanka Chopra walked away with a special "Green" IIFA award to honor her environmenmental work she has performed in rural India. The evening did drag on hovering around the four hour range, but some dazzling performances by Priyanka Chopra herself, as well as Shilpa Shetty and Shah Rukh Khan. Acting at times as a host, recipient of the award for best actor in a leading role for "My Name is Khan" and performer, Shah Rukh Khan was a busy man at IIFA. He even had to sprawl his legs away from a love-struck and overzealous fan who leaped onto the stage in an awkward attempt to touch Khan's feet. Khan handled the situation relatively well as the audience scratched their heads in confusion while security eventually subdued the boisterous Bollywood aficionado. Ranveer Singh also was a bright spot during the evening. He not only grabbed the best newcomer award for "Band Baaja Baaraat" but put out a hearty performance on stage leaving fans with the indelible impression that indeed this is only the beginning of his so far highly successful stint in Bollywood.